Tap here to discover my new Multi-Touch book! 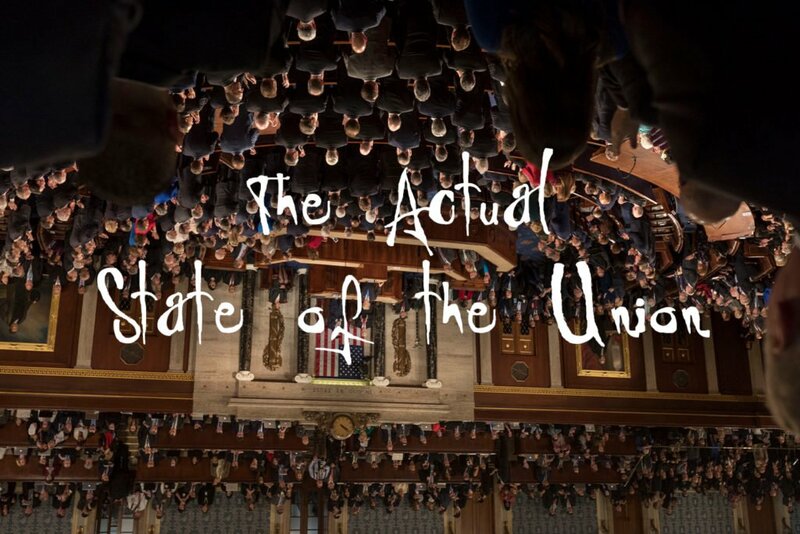 Here’s the actual state of the union: a failed presidency, in which the bonds of trust between voters and leaders have been decisively severed. Where did Trump spring from? : George W. Bush and the establishment Republicans who gave us perpetual endless Iraq/Afghan war and a financial crisis and empowered the white evangelical loony right by letting their pro-Israel/Jesus-Return insanity shape American foreign policy. After years of a hateful lunatic in the presidency, how do we make our way back into love, beauty and creation? Discover my book Letter to Lucy: A Manifesto of Creative Redemption—In the Age of Trump, Fascism and Lies, a multi-touch book about art, love and parenting, from the fall of the Byzantine Empire to the prophetic music of Green Day and everything in between. Read the first chapter for free on your kindle fire or iOS device. Available now on iBooks and Amazon. Want more political videos and commentary? Show your support. Frank Schaeffer is a New York Times bestselling author, speaker, and painter. Click here to buy Frank's Multi-Touch book, "Letter to Lucy: A Manifesto of Creative Redemption—In the Age of Trump, Fascism and Lies" on iBooks. Previous Post Even Tucker Carlson… Next Post Are Conservative Evangelicals An Actual Hate Group? What Would Jesus Say? In Matamoros, Mexico, 70,000 are striking workers from multiple plants. Their strategy is worthy of careful study. 1] First, they called a mass meeting and repudiated the union, detested for its collaboration with the companies. 2] Freed at last from union gagging, they discussed options democratically and found overwhelming support for a strike. 3] They formulated their own demands: huge wage increase, payment of stolen bonuses, and elimination of union dues. 4] They did what unions haven’t done for decades: they united with the working class in other plants. They marched through the industrial parks, calling their coworkers to join them, paralyzing the local economy. 5] They bypassed official channels, pro-industry media and lying trade union officers in order to flow news freely in the city of 500,000. In Mexico, the US and Canada, the official response has been a total, national news blackout. It’s the same policy you followed last year, Frank, in your refusal to utter a solitary word of support for striking teachers, miner or nurses. And why the silence? Just this! BOTH Republican and Democrat sections of the ruling class are utterly terrified of the working class resistance that is already arising independent of trade union OR Democratic Party sway! Worse, the Democrat Party is terrified to have Trump address Congress. The typically overwhelming ovations he’d get would completely expose DP/GOP complicity before an increasingly irrelevant, alienated and angered working class! As if some hugely insurmountable issue existed about how best to ‘secure’ a border [a few more billion atop the 25 on which they already settled by sacrificing immigrant lives], the DP/GOP now sacrifices federal workers, native peoples and others. So where are we left? Capitalism’s two, chief social classes – the capitalist class, and the working class – are unveiling two alternatives for the future of humankind. The working class mobilized 70,000 striking workers independent of official channels and trade union criminal/bosses, to put forth the alternative agenda that is necessary to affirm decency and to avert our descent into complete barbarism. The instruments of the capitalist class are the poison of nationalism, censorship, repression, militarism, war and naked, coercive power. The instruments of the working class are the strike, universal worker unity, new independent institutions, democracy, peace and justice. Labor unrest is mounting in Central and South America, the Yellow Vests and Red Pens in France, New Zealand Doctors, German Steel workers and airline workers, Sri Lanka garment workers and more. It’s happening in Iran, Russia, and India, where millions walked off the job recently. Above all, it’s happening in the US. Due to the Mexican strike, US auto-parts are in short supply. Some US plants are closing. Everywhere it is threatening to burst all efforts to contain it. Everywhere, worker unrest seeks to join with workers everywhere. In the UK, France, Germany and everywhere, police militarize and prepare to turn guns on their own populations. Frank, already pressure is mounting. As it does, you’re going to have to side the Capitalist or the working class. It will be one or the other. You won’t have any choice. However much socialism is proclaimed to be an abject failure, events demonstrate daily that Marx’ thought has never been more relevant.